In a medium saucepan, bring water to a slight simmer. Add chicken breasts and poach for 15 minutes until cooked through. Remove chicken breasts and let cool slightly, then shred. In a large skillet, heat olive oil. Then add onions, garlic, and canned diced green chiles. Cook until veggies are softened, then stir in shredded chicken and red pepper flakes. Season with salt and pepper and set aside. Scramble eggs with 2 tablespoons water. Add eggs to a nonstick skillet over medium heat and cook until almost cooked through. It's okay to undercook them slightly. Working with one tortilla at a time, add 1/4 of the scrambled eggs, about 1/2 cup of the chicken mixture, and then top with a handful of grated cheese. Roll up burrito tightly and set it on a baking sheet. Repeat with other tortillas. Bake burritos at 350°F for 10 minutes. Then add a sprinkle of cheese to the top of each one and bake for another 3 minutes. Meanwhile, blend together yogurt and one avocado in a food processor until smooth. Season with a pinch of salt. When burritos come out of oven, top with the guacamole sauce, hot sauce, and sliced avocado. If you’ve ever been to a Tex-Mex place for breakfast, you’re probably familiar with huevos rancheros. It’s a traditional Mexican breakfast with beans, cheese, tortillas and eggs. It’s really hard to beat a good huevos rancheros breakfast, but I think I may have done it! 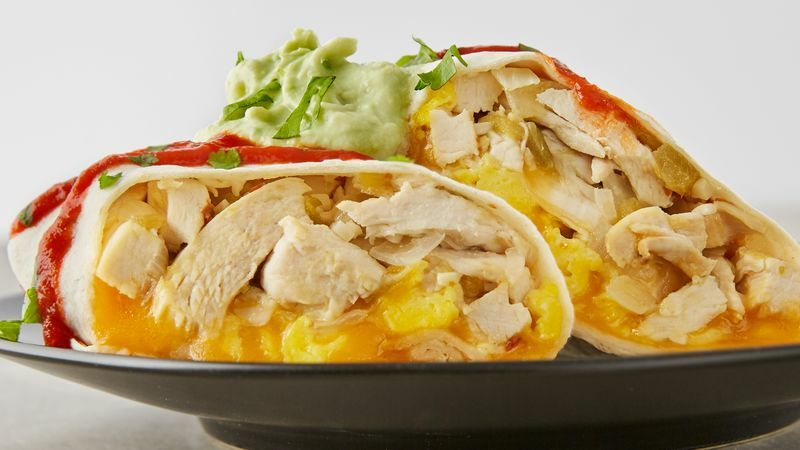 Let me introduce you to the Huevos Ranchicken, which is very similar to the traditional recipe except wrapped in a burrito and topped with a delicious guacamole sauce. There’s no particular reason why you need to use chicken for this dish. You could also use black beans or some other kind of meat (or tofu). Of course, I think huevos ranchicken has a nice ring to it. If you are using chicken, you can either use leftover shredded chicken or lightly poach two large chicken breasts in slightly simmering water for about 15 minutes until they are cooked through. Then, once the chicken has cooled, use two forks to roughly shred the meat. In a large skillet, heat your oil over medium heat and add the diced onions, garlic, and canned chile peppers (plus all the juice). Cook that for a few minutes until the veggies are tender, then stir in the shredded chicken. Season this mixture with some red pepper flakes and salt and pepper. One of the best parts of this recipe is the guacamole sauce. It’s dumb simple to make but people will be impressed. Basically just puree some Greek yogurt (or sour cream) with an avocado and season it with a pinch of salt. It’s a delicious and simple sauce – and will counteract some of the heat from the burrito. It’s wouldn’t be huevos ranchicken without the huevos so you’ll need some scrambled eggs. I just lightly scrambled a few eggs (1.5 eggs per burrito) with a few tablespoons of water and then cooked them over medium heat until they were almost set. It’s okay to undercook the eggs slightly as they will finish cooking in the oven. Now it’s time to make a burrito! Get the largest tortillas you can find and scoop in a good helping of eggs. Then add in about 1/3-1/2 cup of the chicken mixture. Follow that with a handful of grated cheese. I use a Colby Jack blend, but you can use any cheese that you like. Roll up your burritos and then bake them on a baking sheet for 10 minutes at 350 degrees. This baking time will finish cooking the eggs and also melt the cheese. As an added touch, you can sprinkle a bit more cheese on each burrito and bake it for an extra few minutes. More cheese is never bad right? Then just top each burrito with some of the guacamole sauce, hot sauce, and sliced avocado. I like to serve this with some fruit salad to lighten up the meal a bit. This breakfast is really hard to beat – and you could also make it in bulk really easily. My wife proclaimed it “the perfect breakfast” and I can’t disagree with her! Nick ate all the leftover guacamole sauce for this recipe with chips. It was wonderful. Be sure to check out his blog, Macheesmo, his book, Cornerstone Cooking, and check out his Tablespoon profile.